Disclaimer: I received a copy of this book in a tor.com sweepstakes. This has in no way affected my review. I had essentially no expectations going into this book–which is unusual for me, these days. Most everything I pick up is either by an author I already know and trust, or upon the recommendation of a large number of friends. My TBR pile is just too big to allow for much else. But I had a review copy of this one, and one of my goals for this year was to start reviewing the books I win in sweepstakes–or why else enter them? So, I read this one. And I was very pleasantly surprised. The book combines a number of very exciting, interesting elements that I did not expect, and it makes for a quite interesting read. Much of it has some very intriguing scientific basis, and I thoroughly enjoyed the creativity it showed. The first cool idea is that of the wasters, which grows naturally from the teleportation in the book. The teleportation accepts the limits of lightspeed–but still allows for transportation to seem instantaneous to the user. In essence, to travel 9 light-years away, you also have to travel 9 light-years into the future–and there’s no going back. The explorers of the society have been dubbed wasters, those who travel so often that politics, families, etc. all have little meaning to them. Our main POV character, Sara, is a waster, and the jumps in time that she goes through give her a really cool background–and bring up some questions I’d honestly never asked myself. But that’s just a small part of it, and almost brushed aside just as a piece of world-building. The real story here is about an accidental first contact with s species of blind humans in a location 54 light-years away from the closest civilization, all set on a planet dangerously near completely undecipherable clumps of dark matter, covered (among other things) with strange multi-dimensional forests that are truly mind-boggling. The world-building–or perhaps I should say worlds-building–here is superb, but it never gets in the way of the story, and the story is brilliant. I can’t say too much about it without spoiling things, but I will say that it plays to the strong points of science fiction while always being, at its core, a story about the characters, the main group of which are extremely well sketched out. If I had any complaints with the book, they would be with the ending. Before then, it seemed that things might have a scientific explanation, but some of the character actions and abilities shown near the end verge on magic, which I was not expecting from the science fiction setting. Then again, it’s not like we’ve never had a story where the main character saves the day by shooting torpedoes down an impossible shaft that nobody else can hit by using a mysterious magical power at the end of a science fiction story, so… Your mileage may vary. Just be aware that if you’re looking for pure hard-sf, you will be a little disappointed. And while I’m on the subject, the science fiction that is mentioned here is really cool. Parts of the novel felt like The Three-Body Problem–except they were exciting the whole time. The book works very well as a stand-alone, and I did not realize until I was doing some research after reading that it’s not the only book that Gilman has written in this universe–and I’m definitely going to be picking up the other one, and reading it when I can fit it in my schedule. 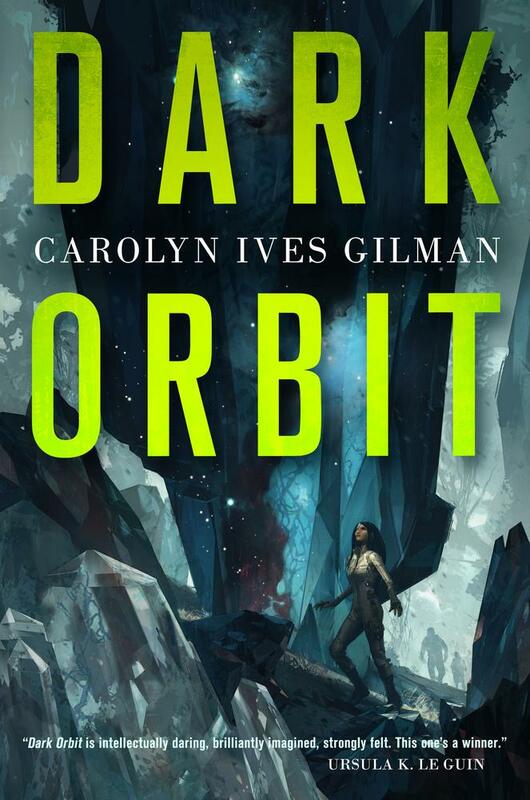 In summary, Dark Orbit was a complete surprise–and a delightful one, with some really cool science-based world-building, great characters, and a plot that kept me interested the entire time. Even if the ending wasn’t perfectly what I was expecting, the novel as a whole was a thoroughly enjoyable experience, and I give it a hearty four of five stars. Also, check out this really cool guest post that she did over at The Book Smugglers. The cover and the premise looks amazing, glad to hear that the book mostly lives up to them. It’s always tough with endings, I rarely read one I am satisfied with. Great review!